Are you headed to Brazil for the World Cup later this week? Are you fluent in Portuguese ,do yo know any Portuguese at all? Well language learning giant Rosetta Stone has prepared an app just for people looking to learn Portuguese for the World Cup. The app is the latest installment of the company’s travel app series and is designed to serve as a pocket dictionary, translator, teacher of sorts for soccer fans to use in Brazil during the event. A localized language curriculum built to help visitors navigate their way around the 12 Brazilian cities where the World Cup tournament games will be played. No requirement of Wi-Fi or a wireless network once it’s downloaded. Free immediate download in both iOS and Android ecosystems. Rosetta Stone’s Futebol edition features a localized language curriculum built to help visitors navigate their way around various Brazilian cities hosting tournament games. The app includes a rich assortment of travel and culture resources for visitors, such as language guides to public transportation, restaurants and hotels, tourist attractions, and hospitals. 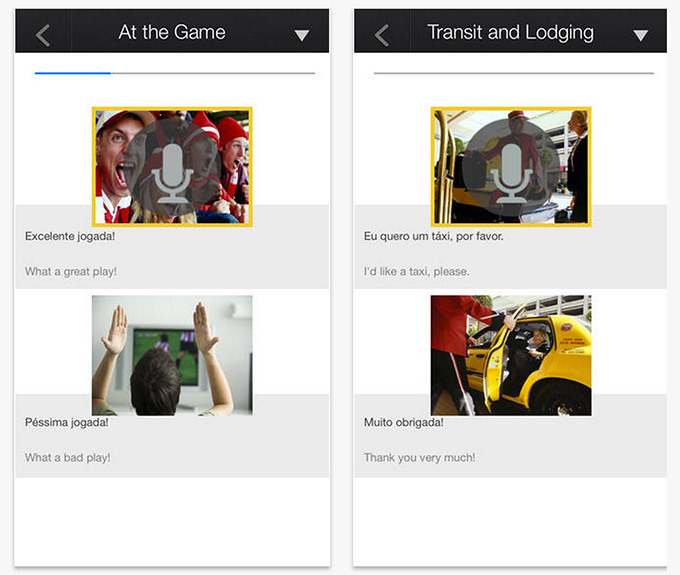 Rosetta Stone Travel Portuguese Futebol Edition is now available for native English and German speakers. It can be downloaded all over the world, and will enjoy a concentrated marketing push by Rosetta Stone in North America, Brazil, Germany and the UK. Rosetta Stone Travel English was released in Brazil earlier this year and has helped thousands of native Portuguese speakers prepare for the impending arrival of tourists and sports enthusiasts from America and around the world. Like all of the apps in the Rosetta Stone Travel series, Rosetta Stone’s new Futebol edition features many of Rosetta Stone’s proven-effective language-learning tools, including an immersion-based introduction to Portuguese and a finely tuned version of the company’s proprietary speech-recognition technology. The app teaches new words, guides pronunciation, and uses smartly-sequenced images to help learners naturally connect language, meaning and context. Rosetta Stone’s intuitive methodology stimulates the brain’s natural language-learning ability and drives retention more effectively than other products on the market. To date, Rosetta Stone Travel apps have enjoyed nearly half a million downloads. To download Rosetta Stone Travel Portuguese Futebol Edition, visit the App Store and/or Google Play.